Touch tournaments with the foam sword, organized and sponsored by Les Ateliers Nemesis! The fighters will have to turn a roulette to know which combinations of weapons they will have to use (it is imposed and very random) Let’s not forget that this event is organized by ratmen! To win you have to touch the opponent 3 times. The winners will compete until there is only one big winner. There will be a tournament on Saturday and Sunday at the Foam Sword Arena outside, starting at 1pm. Participants must find Racaille, the rat man, in the Fair to register. 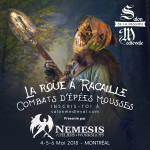 Participants must have paid for their entry to the Montreal Medieval Fair to participate.